Delaney Greer returns the ball over the net for Washington during its season-opening match against Clinton-Massie Tuesday, Aug. 23, 2016 at Washington High School. The Washington Lady Blue Lions volleyball team opened the 2016 season with a three sets to none victory over visiting Clinton-Massie Tuesday evening. Scores of the varsity match were 25-17, 25-22 and 25-20. “I think we did a great job of attacking the ball, getting around to the ball and taking care of the ball on our side,” Washington head coach Ashley DeAtley said. “We played a little bit relaxed tonight, which is going to have to change between now and Thursday, because we have a huge match with Chillicothe on Thursday. Statistically for Washington, Victoria Jones had eight solo blocks and six block assists. Miranda Landis had three solo blocks and 20 block assists. Jones and Hannah Haithcock were tied for the most kills, each with six. Delaney Greer had four kills. In serving, Landis led with two ace serves. Madalyn Wayne had five digs for the Lady Lions. 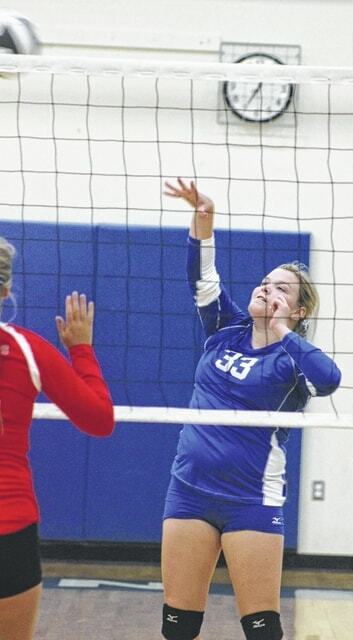 Washington has a key early season match against defending SCOL champions Chillicothe Thursday. The j-v game will start things off at 5 p.m.
Washington won the j-v match over Massie Tuesday, 25-17 and 25-23.